The two of you have been riding motorcycles together since your very first date! Whether you both have bikes or the motorbike belongs to just one of you, you both love heading off down the highway with the wind in your hair and enjoying rides together. That's why you're planning a motorcycle wedding theme, and why you simply must top off your cake with one of our motorbike wedding cake toppers to carry that theme all the way to the top of your cake! Perfect for any motorcycle wedding theme, our motorbike wedding cake toppers are custom crafted, so we make each motorcycle look as much like the real thing as possible. You can see this in the motorcycle wedding cake topper sample design included here where we included even small details like the red rims on the bike. The idea behind this particular design is that the groom has pulled up in front of the bride and is doing a stoppie to try and impress her. He's hoping to score a kiss, but it's clear from how she has her hands on her hips that she wants him to get off the bike and get ready to get hitched! 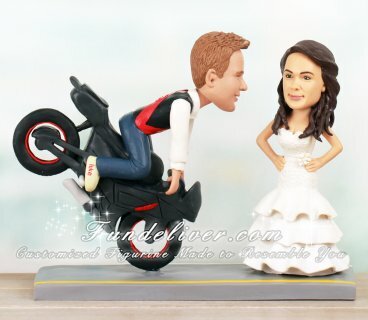 When we make a motorcycle wedding cake topper for you, we can dress the two of you however you wish. 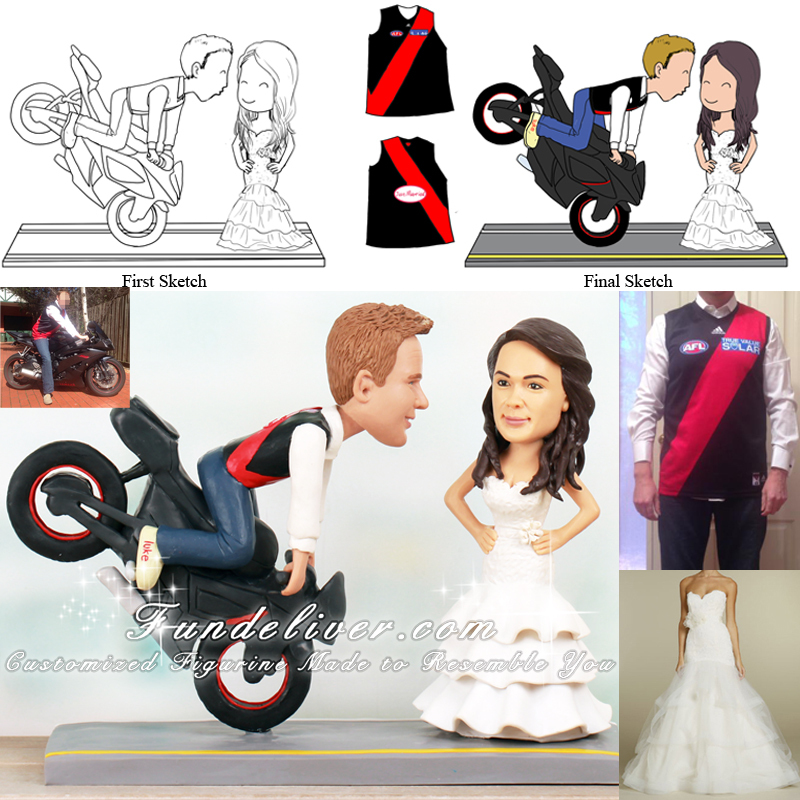 In the motorbike wedding cake toppers, the groom is wearing a replica of his favorite soccer team's jersey, and the bride is dressed in her full white strapless mermaid tail wedding gown with ruffled skirting.